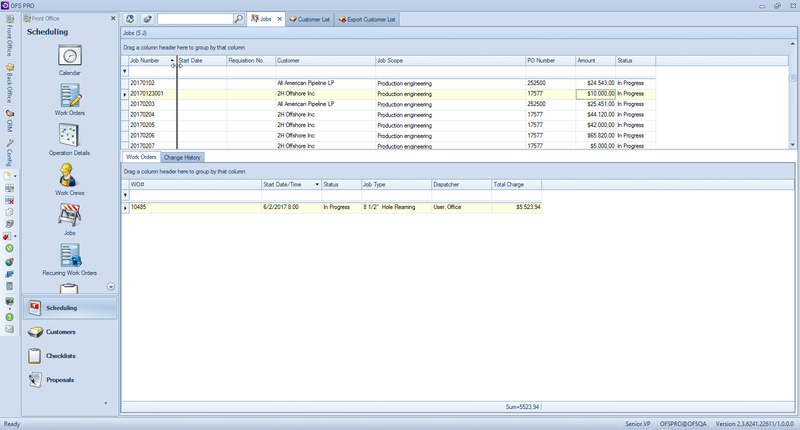 The Main Window is the heart and soul of the OFS Pro application. Most main windows hold at least one data grid. The data grid is your visual interface giving you access to all types of data stored within your company’s database. 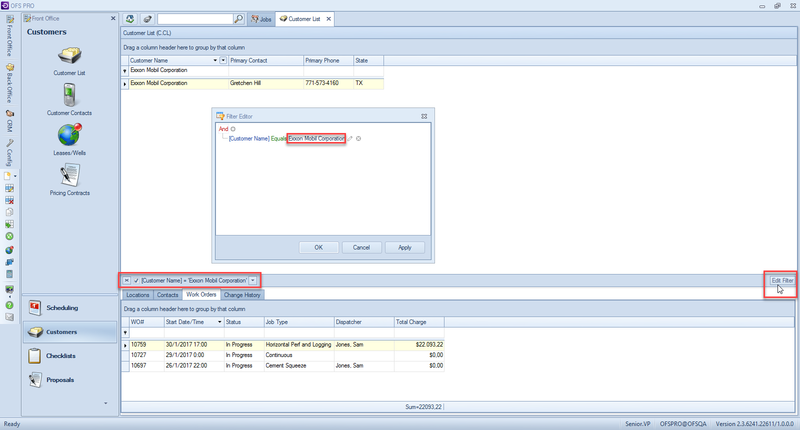 Copy Cell – Copy the contents of the cell to the clipboard. 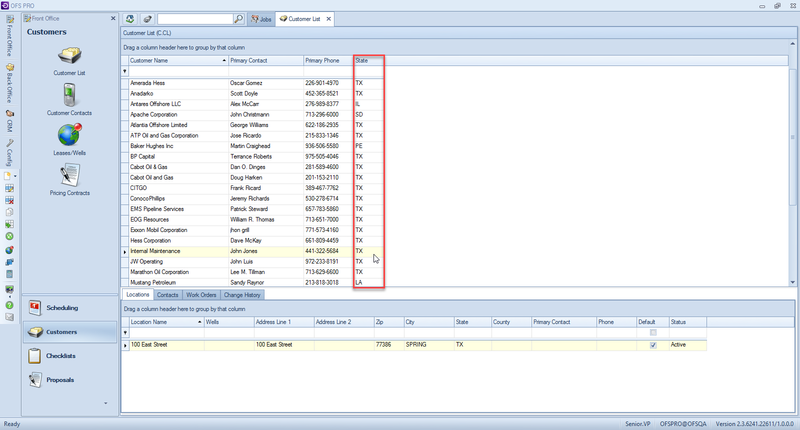 Clear All Filters – If columns have filters set (see “Filtering Grids” below), select this to quickly show all rows. Close the tabs by left-clicking the red X on the tab of the active window. Otherwise, the oldest one will close automatically after more than eight have been opened. 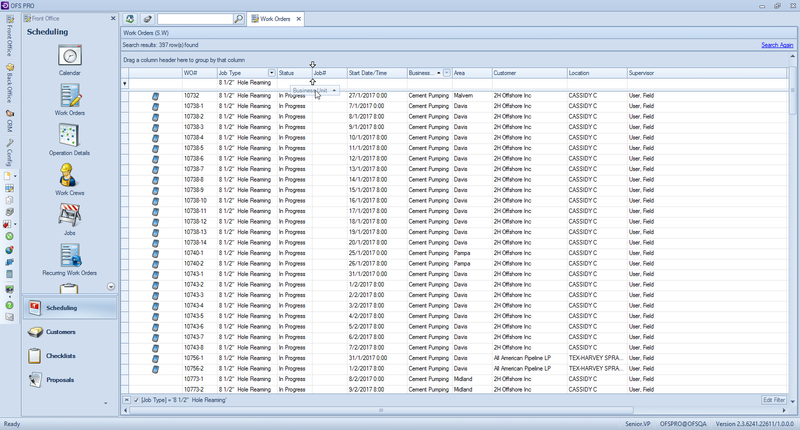 The grid can be sorted in multiple columns by clicking one column, then holding Shift and clicking the next column. Clear sorting easily by clicking sorted columns while holding Ctrl. Filter your grids in every way imaginable for maximum customization! Finally, most columns include a drop-down list displaying all possible values the grid contains for cells within your chosen column. This enables searching by cells which are blank only, cells which are not blank only and setting up an advanced custom filter (detailed below). Click the “Edit Filter” button on the right side of the filter bar to open the Filter Editor for advanced editing. The filter editor allows you to specify multiple fields to display a certain set of given combinatorial Boolean logic. Set your own customized layout of data grids: edit column widths, column display order, visible columns and more. In The Customer List you can temporarily hide columns as follows: dragging the column header down into the data grid, until a large X appears. To re-show hidden columns, right-click any column headers and click “Column Customization”, then drag the header out of the box. Group grid rows by dragging the column headers onto the panel labeled “Drag a column header here to groups by that column”. 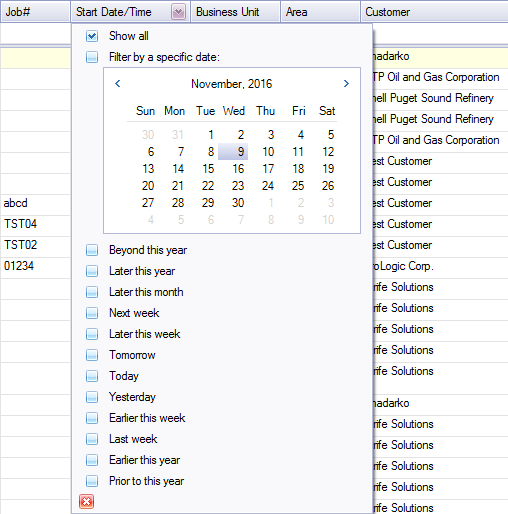 You can group by multiple columns for easy at-a-glance filtering. 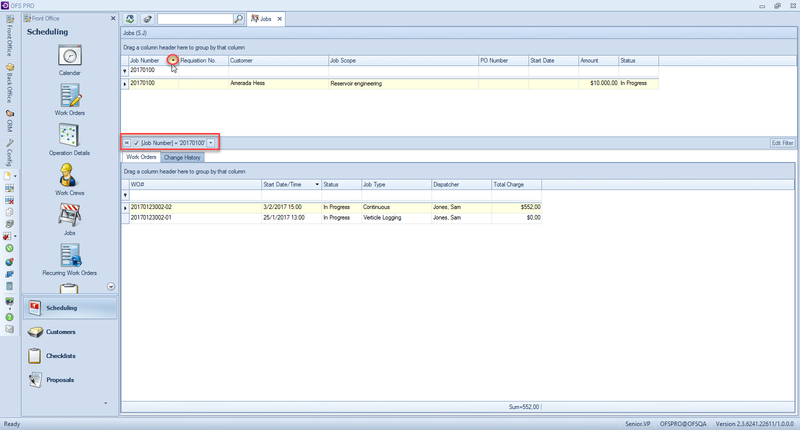 Fix columns in place by right-clicking on the column header; a Column Fixing menu will display. Fixed None – Unfix the selected column. Fixed Left – Fix the columns to the left of selected column. 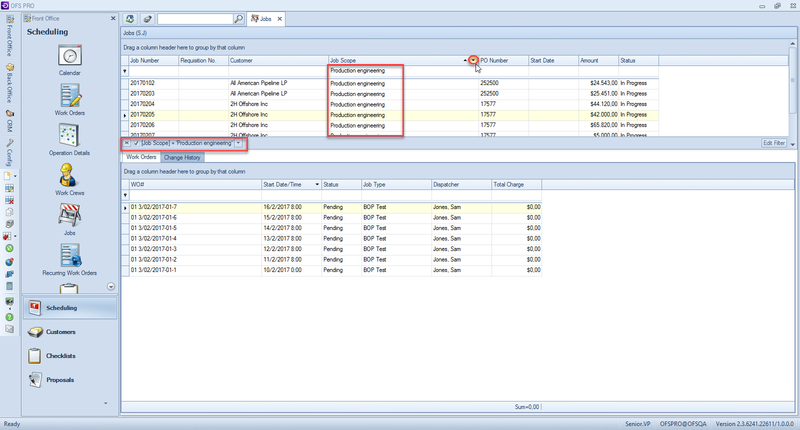 Fixed Right – Fix the columns to the right of selected column. Clear Column Fixing – Reset all fixing. Column Customization – Opens the Customization window (as seen above). Reset all customization of the layout by clicking Reset Layout under the top View menu. 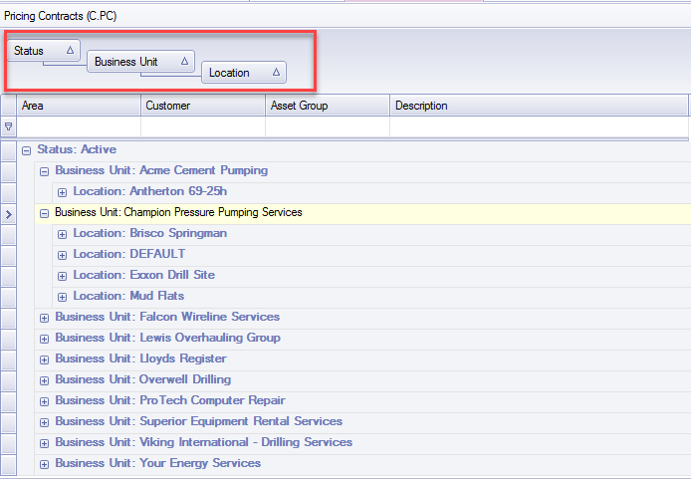 In order to help you get back to a view you took time to create, OFS Pro has recently implemented “Saved Views“. In addition to saving customized window appearance for yourself, you may also share them with other in-company users of OFS Pro, as well as use ones others have uploaded. This ensures the best in swiftness, efficiency and consistency. Let’s take the “Cleaning” filter from “Advanced Filtering” above as an example. To save this view, simply give it a name, and then press the + button to the right. From then on, you will be able to view the window in the same way each time! Just press the down arrow and select your chosen view from the drop-down list that appears. To make the view public, first press the globe button on the far right – the tooltip on hover reads “Toggle saving view as public” – then save the view. When the globe is blue, any saved views that you have created will be visible to everyone else and you will be able to see all previous views from other users.